There is a great number of different laptop stands, and not all of them are suitable for use on your desk. In this article, we’ll review some laptop stands for desks that feature a steep slope – the most important quality for desktop laptop stands — and thus should be preferred for desktop use. 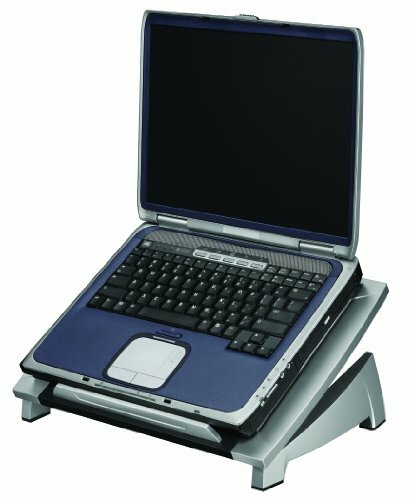 1 What Features To Look For In Laptop Stands For Desks? What Features To Look For In Laptop Stands For Desks? There are quite a lot of features to consider when looking for a desktop laptop stand. The most important feature is the stand’s maximum height, as a laptop requires a rather steep lift if you want to use it as a desktop computer replacement. Secondly, the laptop stand has to be rather solid and durable, as laptop stands, when wearing out, can lose the slope partially. If you want to use your laptop as a desktop computer, an elevator laptop stand is the best choice, as cushions and mats just won’t cut it — that’s why the two choices provided below are elevator laptop stands. 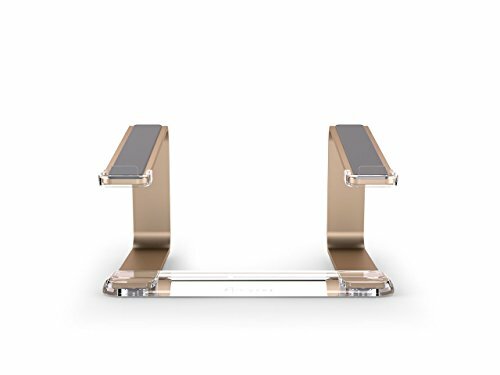 The Griffin GC16034 laptop stand provides a steep rise that makes the viewing angle a lot more comfortable, as well as allows you to use an external keyboard. It’s quite inexpensive, grips the laptop well (rubber pads), and is also quite stylish. The Griffin GC16034 holds the laptop’s sides, so it doesn’t interfere with the laptop’s ventilation at all. The Fellowes Laptop Riser is another great option for a desk laptop stand. It has an adjustable height, and provides a more comfortable typing and viewing angle, without making an external keyboard mandatory. It doesn’t raise the laptop as high as the Griffin model does, but then again, it’s cheaper than the Griffin, too.